Ven. Thubten Dondrub with students Phoebe McColl, Catherine Honeychurch, Peter Koegst, Paul Kersten, Katherine Danford-Storey, Marlene Robins, Tim Eisemann, John Niessen, Judy Wagner, Sue Dixon, as well as center director Becky Geisler and center manager Fran Rowley, De-Tong Ling Retreat Centre, Kangraroo Island, South Australia, October 2018. Photo by retreatant. 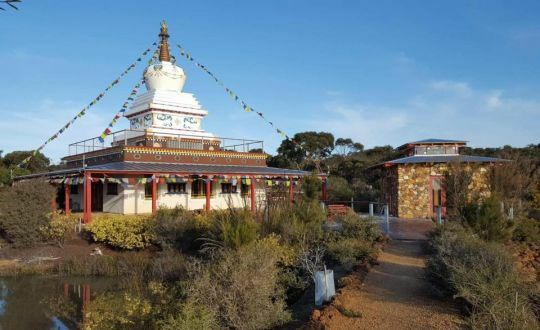 Each year De-Tong Ling Retreat Centre, an FPMT center on Kangaroo Island, South Australia, offers an annual ten-day lamrim meditation retreat. Anthony Reid, one of the center’s board members, shares about the 2018 retreat. Meditative retreat is a cornerstone of the Buddhist tradition. Retreat is the physical action of living in a quiet location; it is avoiding unnecessary conversations; and it is the process of cultivating mental focus on the Buddhadharma. It takes special conditions for a meditative retreat to be effective, powerful, and transformative. Lama Zopa Rinpoche said, “A retreat place is not for gaining power like black magic, it’s not for a honeymoon or holiday. Also it is not a place in which to be spaced out. Enlightenment stupa and prayer wheel house, De-Tong Ling Retreat Centre, Kangaroo Island, South Australia, July 2018. Photo courtesy of De-Tong Ling Retreat Centre. At De-Tong Ling Retreat Center, located on the beautiful Kangaroo Island off the southern coast of South Australia, the conditions for deep retreat are met. Ten people joined experienced FPMT registered teacher Ven. Thubten Dondrub for the annual Ten-Day Lamrim Retreat at De-Tong Ling, from October 1-10, 2018. Lamrim teachings and guided meditations by Ven. Thubten Dondrub were aimed at facilitating internal experience and transformation for the retreatants. With the optimal external conditions of a silent meditation hall located beneath an inspiring enlightenment stupa overlooking a turquoise blue lake and a view out across pristine native vegetation towards the distant ocean, the retreat delivered experience in abundance for the fortunate attendees. Ven. 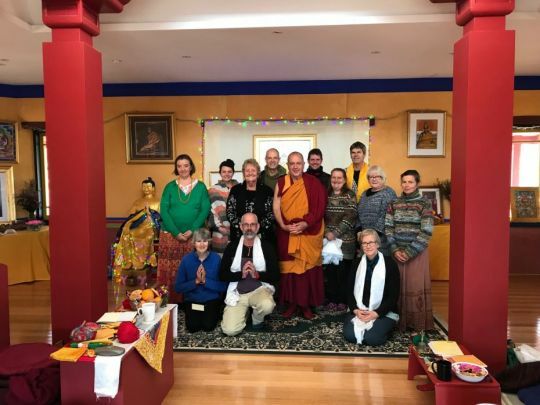 Thubten Dondrub and students inside of the gompa beneath the enlightenment stupa, De-Tong Ling Retreat Centre, Kangaroo Island, South Australia, October 2018. Photo by retreatant. 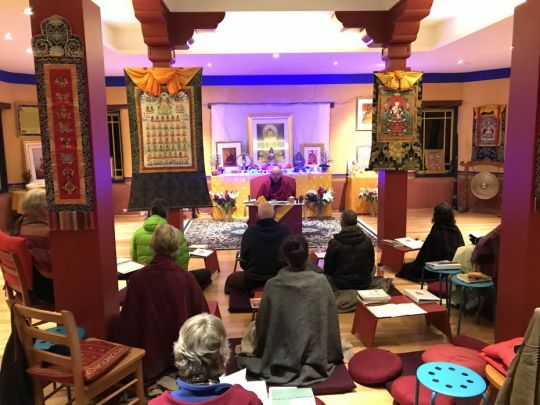 “Being led through meditations … and reflecting on the lamrim brings the teachings alive and has deepened my understanding,” shared one retreatant. One of the benefits of group retreat is having support of fellow attendees. One attendee noted the group energy made “the atmosphere very pleasant,” and people found courage to persist through times of difficulty and clarify their perceptions of the teachings through focused discussion. Accommodation at De-Tong Ling was enjoyed by all, with some opting for rooms in the eco-friendly rammed earth house on adjoining Yacca Creeks land, and others for more “rustic” experience in tents. Either way the opportunity to get back in touch with nature, with the vast Kangaroo Island skies and the silence of the Australian bush, brought a new level of experience for the retreatants. Ven. Thubten Dondrub and De-Tong Ling Retreat Centre center manager Fran Rowley, De-Tong Ling Retreat Centre, Kangaroo Island, South Australia, October 2018. Photo by retreatant. 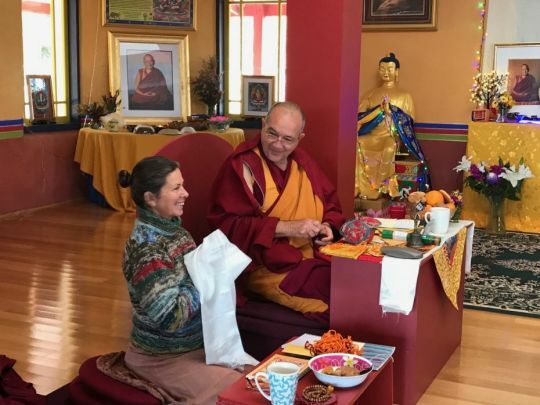 We hope that this transition to daily life outside of the retreat setting will be made easier knowing a place like De-Tong Ling is in existence and is a sanctuary for students from across FPMT providing the perfect conditions for retreat.